Over 45 and have a slowing metabolism? It’s not all your fault! If you are like most middle-aged people, you went through your 20s pretty much being able to eat whatever you wanted. The calories were burning up, you were feeling and looking great, and you didn’t think twice about that little thing called your metabolism. But once you left your 20s, things began to change, and not for the better. Your metabolism begins to slow down as you get older, especially once you have hit the your 40s. At 45, your metabolism has been playing dirty tricks on you for a while now, and you are likely seeing the results of it. You know, the weight that creeps up out of nowhere. Even when you are exercising you are not seeing the scale move, or it may be moving in the direction that you don’t want it to. There are many things that slow our metabolism down, including just the aging process. As you get older, your metabolism naturally slows down a bit. This is how you can maintain an exercise routine and watch your diet and yet you start losing some muscle and gaining some fat. It happens, but there are things you can do to try and combat this process and to stay ahead of it. When your metabolism slows down naturally due to aging, that is not your fault. It’s also not your fault that you didn’t realize there are things you may be doing that are adding to that. After all, most people are not taught about what it takes to keep the metabolism revving, especially after they turn 45. As you start to age, you will end up losing muscle every year, and it may be replaced by fat, depending on the lifestyle that you live. You can’t stop the aging process, but you can do a lot to help make it better. Some of the things you may be doing to slow your metabolism down and not even realize it include not exercising regularly and skipping meals. If you are someone who is skipping breakfast and not sticking to an exercise plan, then there’s a good chance that it’s slowing your metabolism down. It’s important to do things that will help to keep your metabolism burning strong, despite the years going by. While it’s not your fault that your metabolism may slow down, it is within your power to help combat it. You can do this by sticking to an exercise routine, having a weight training plan (so the muscle burns more calories), and by eating a healthy diet and not skipping meals. As a fitness expert and personal trainer in the Pacific Northwest, I have helped many people over the age of 45 with their fitness routines and goals. I have seen the difference that it makes in their life, and I can help you do the same. You don’t have to be a victim of your metabolism. Not anymore! Sometimes my clients tell me that turning 50 or 60 just crept up on them. They were cruising along and all of sudden they hit that age and were kind of shocked. Some of them had been physically active throughout their adult lives, but others had not been very active. The good news is that it’s never too late to get started with being physically active and getting regular exercise. If you are over 50 and have been living a sedentary lifestyle, it’s a good idea to check with your doctor before beginning any regular exercise routine. Most people will get the thumbs up and you will be ready to go. Getting plenty of exercise, especially when you are over the age of 50, is important to your long-term health. It can help you to remain more mobile, help fend off some common diseases, and keep you feeling and looking better into your golden years. Plus, it will give you the energy you need to keep up with and be an active part of your grandchildren’s lives. Make the commitment. Having an exercise program requires you to get real with yourself and make the commitment to caring for yourself. You have to hold yourself accountable so that you stick with it. Find an exercise that you enjoy, or a couple of them so that you can switch it up and keep from getting bored. If you enjoy running and biking, then alternate your cardio program to include both of those. Mix it up a little by getting in a few hikes here and there. Aim for getting at least 30 minutes of cardio exercise per day. Get properly fitted for shoes for your cardio routine. Visit a running or fitness store, so the staff can evaluate your foot and gait and fit you with a pair of shoes that will keep your feet feeling great as you exercise. 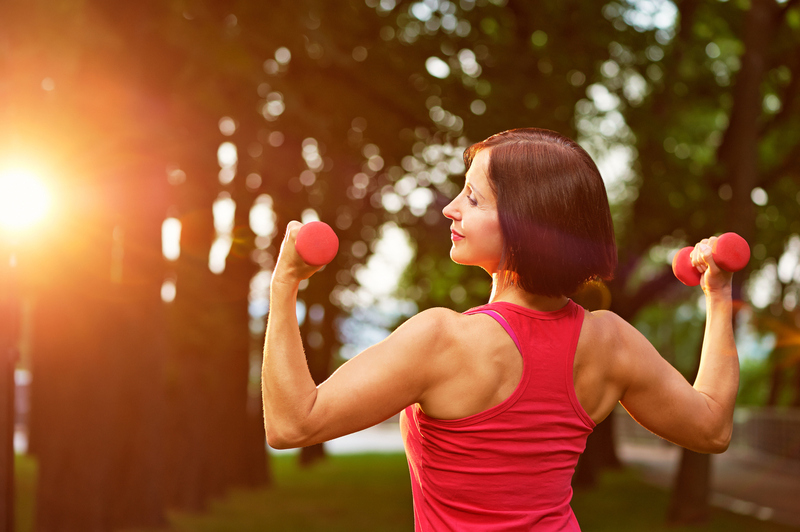 Be sure to do some strength training, which is going to help keep your bones strong and keep you burning more calories for longer periods of time. Weight training exercises should be done on at least two days per week and it should work all of your major muscle groups. Choose the time of day that works best for you. The best time of the day for you to exercise is going to be the one that you will stick with doing. Find a way at least once per week to relax and reduce stress, such as doing yoga, tai chi, meditation or spending time out in nature. While you are putting all of this effort into taking care of yourself, don’t overlook healthy eating. You can’t outrun and out-exercise a poor diet. Opt for plenty of whole foods, including lots of fruits and vegetables and lean sources of protein. Also, don’t feel you need to go it alone, you can always work with a personal trainer to get your routine started. 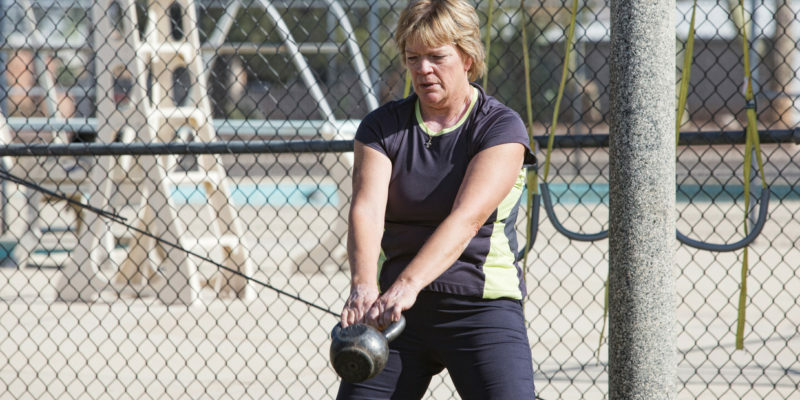 As a personal trainer, I have worked with many people over the age of 50 all over the Pacific Northwest, and I can help you reach your fitness and exercise goals, too!